“The LHC has been a huge effort over more than 15 years. 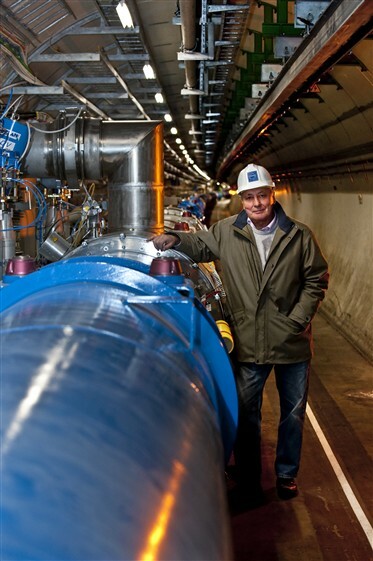 It’s not always been easy but today it is performing so spectacularly well that the people who built it should be very proud.” Lyn Evans, head of the LHC project since its beginning and until its commissioning in 2011, shares his recollections with us on the day of the long-awaited discovery. Lyn Evans, former head of the LHC project, in the LHC tunnel, 2008. While you were building the LHC, were you expecting it to perform so well? Lyn Evans: I knew that the machine had been beautifully designed and was being built extremely well – but I could not have expected that such wonderful results could be achieved in so little time. What are the reasons for such a good performance? Evans: The LHC was designed to really push the limits; I think that the machine has got more than 30 years of accumulated experience in its design. The fact is the LHC has already exceeded the design luminosity at the energy it’s at now. At 4 TeV it should be at 5 x1033 – and it is quite a bit higher. So, the LHC has exceeded expectations – and the reason is because of the quality of the design. There are no miracles; this is why the machine has been working so incredibly well. The quality of the magnets and the stability of the power supplies are fantastic – much better than has ever been achieved before. And the quality of the instrumentation is essential - the LHC is instrumented like nothing ever before. Even during the financial crisis in 2001, when there was a lot of pressure to reduce cost, we never gave in a single centime for instrumentation. Evans: When the project started we said that we would review the cost at mid-term and adjust accordingly. When we did that, we found it 18% higher than the 1993 cost projection. This, on such a technically advanced project that had never been built before, could be regarded as a relatively small variation. However, it did indeed cause a lot of reactions. What are the challenges that you had to face? Evans: The challenges changed over time. In the first few years, they were essentially political. The challenge was with getting approvals, and getting some big countries on board (the non-Member States). Then, of course, the challenge became development and design. When we got the approval from the CERN Council, we didn’t have a single magnet that worked. After that, the challenge became massive manufacturing, where we had lots of problems. You will certainly remember, for instance, issues with the cryogenic line. Of course the real kick in the teeth was the last one, when we were taking the very last sector up to high current and a joint failed. It caused a lot of pain, although we did have spare parts, which was the most important thing. So, all the way along the challenges have been different. I had to face 5 bankruptcy cases – and, I can tell you, that’s not funny. When you’re in the middle of production and suddenly the firm goes bust, how do you react? So – let’s say – there was a whole spectrum of things that had to be dealt with. And we all remember the commissioning – the day of the first beam in the LHC – when the pressure was absolutely immense. But in one hour we had the machine beam circulating, and I’d never seen anything like it before. Normally, this would have taken 2 weeks! You were recently appointed Linear Collider Director by the International Committee for Future Accelerators. Cutting-edge accelerators are still inspiring you! Evans: Well, I came to CERN as a laser physicist, not as a HEP physicist. I first came to CERN in October 1969 for 3 months because they were working with high power lasers. And then I got a fellowship and – just by chance – became involved in building an experimental linear accelerator. That was my first taste of accelerator physics. It was a 3 MeV accelerator which was basically the prototype for LINAC2 and LINAC4. In 1971, I started working on building the SPS. And, after the idea of stochastic cooling had been proved in the late 70s, I worked on converting the SPS into a proton-proton collider, all the way through to the Nobel Prize in 1984. I also worked for a while at Fermilab’s Tevatron, so I learned about superconducting machines there. I had a relatively short spell – 4 years, from 1990 to 1993 – as division leader of the SPS LEP division. And I was responsible for running and developing LEP, after which I took on developing the LHC. In 1996 we got full approval. I was LHC project leader the whole time, until the commissioning of the machine. So, the LHC has been a big part of my life. I am lucky to have been involved in all the big projects here at CERN – and I guess that’s the way you learn. Of course, you can’t help but be motivated when you are working in such a fantastic place. What do you think is the future of the LHC after the Higgs? Evans: I think that it has a long future. There is nothing like it and there will be nothing like it for a very long time. Even if a linear collider is approved in the next 3 or 4 years, it is going to take around 15 years to build. Furthermore, the LHC is now the only instrument that can access very high energies. I think the LHC is going to be developed to its full capability – both the machine and its detectors will be improved over the coming years. The detectors are already a marvel and the way that they perform is incredible. I hope that there will be many discoveries coming up for the LHC – the Higgs is just the first step. I think it is CERN’s job – independent of whether we build a linear collider or not – to exploit the LHC to its full potential. It may be that science will tell us that we need a higher energy LHC – which today would be very, very difficult to build. But there is still R&D going on – one could imagine doubling the LHC energy, for instance. We build accelerators because science tells us that that is what we need to make achievements possible. Anyway, I think the LHC works so well because of the people: the people who designed it and built it, and also the people who are running it right now, who are just a fantastic group.